A former student of The Sixth Form College, Solihull is building his reputation as a published author, after getting a fiction trilogy published. Ross Turner (aged 24, from Solihull) has written a fantasy series called ‘The Dreadhunt Trilogy’. Book One is called ‘Marcii’, book Two is called ‘Reaper’ and Book Three, which will be published in December, is called ‘Midnight’. The books are a dark fantasy series following Marcii Dougherty, a young woman whose home is being ruled by a tyrant. He accuses people of witchcraft and of summoning demons to besiege the town. Marcii finds herself caught up amidst tortures and executions and then even she herself is found guilty of witchcraft. This is Ross Turner’s third literary series, but his first trilogy. He has previously has six other books published, including two-book series ‘The Tamarack Series’ and two-book series ‘The Redwoods’. His other two books were called ‘Voices in the Mirror’ and ‘Albatross’. Ross was a student at the College from 2008 – 2010. He studied A levels in English Language, Mathematics, Physical Education and Geology (AS level). He is currently working on a prequel to the trilogy, which will be published in 2017. 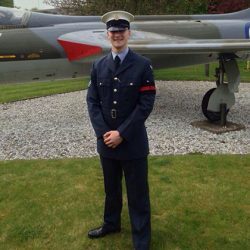 He is juggling his writing with working for the Royal Air Force. People can keep in touch with Ross via his Facebook and Twitter pages: Ross Turner Books on Facebook and @RossTurnerBooks on Twitter.